Is New York the Worst City to Drive In? Accident data and insurance information: This can help determine which states are the most dangerous to drive in. Traffic congestion and travel times: How long does it take you to get from point A to point B? This is an important consideration when ranking the driveability of a city. Financial considerations: How much does insurance cost? Are there toll roads? What’s the price of gas? The actual cost of driving is worth keeping in mind, too. Before we dig into some data, let’s go over some surface level perceptions about driving in New York. 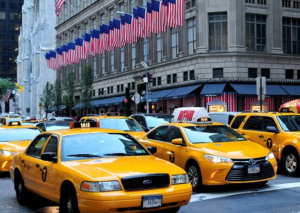 PRO: Once you’re in New York City, you can park in one spot and get around pretty easily by foot, taxi, or subway. You don’t need to spend the day driving around, finding new parking spots, waiting in traffic, etc. This isn’t necessarily a pro in favor of driving, but rather the lack of needing to drive from place to place for transportation in the city. CON: New York driving can be slow, tedious, and frustrating. Taxis and other drivers are known for invading people’s space, never afraid to get anxiously close to you or your vehicle with theirs. CON: You’ll want to plan ahead for parking, as much as possible, because it’s a nightmare. Keep in mind you can’t turn right on a red light, and pay close attention to the parking signs. It’s not hard to land yourself a traffic ticket in NYC, especially if you’re visiting from elsewhere and not used to it. Tension on the road can create dangerous situations as people make risky decisions. That’s how people from outside of NY perceive it, but what about when we look into the numbers? Are you surprised to learn that New York State didn’t show up anywhere in the top 3? It’s not even in the top 10 or 25 for worst places to drive. In fact, you’ve got to drop all the way to number 46 on the list of worst drivers before you find the State of New York, which has a 90.6% insured rate, 2.43 DUI arrests per 1000 drivers, and 0.83 deaths per 100 million miles traveled. In other words, based on the above criteria, New York is the 5th best state for driving, edged out by Connecticut, Nebraska, Vermont, and Massachusetts. Based on these figures, there are states that are more than 2x as fatal as New York for drivers, and 3x as a fatal as Massachusetts. New York also ranks very well for DUI arrests, however, many factors can influence the number of arrests from state to state. Keep in mind that in some states, people need to drive a lot further and more often to travel greater distances between locations. The rural areas are a lot less dense than the urban areas, meaning the average person may spend more time driving or may spend more time at high speeds on highways or dirt roads where accidents are more fatal compared to slow-moving rush hour fender-benders in a busy city. The reputation of New York drivers is that they are angry, and aren’t shy to let you know about it using their horn, their words, or a few very specific hand gestures. In reality, they’ve probably been waiting a really long time to travel a short distance, and are fed up with people who don’t know the area and aren’t familiar with the flow of traffic. Despite all of this, New York is one of the safer places to drive but even locals will warn you to avoid driving in the city as much as possible.